In my blog on the 9th of July I described the need for eGov to deliver new capabilities to drive and manage change. In particular people have been keen to understand more about what we expect of a Design Authority, so, here are the headlines. Historically the organisational structure of the States of Jersey, specifically separate departments under ministerial control, have led to decisions being made on a department by department basis with little consideration of underlying ‘common’ customers. This has resulted in a disjointed approach to service models, technical and data architecture. Similarly there are few common standards or principles to which the business adheres and consequently there are significant opportunities to improve customer service and create a more efficient public sector. The eGov programme has been established to move the States of Jersey towards a more cohesive model, thinking and acting as one business. There is, therefore, a need to build capability for a core function that serves as the design and governance mechanism for all future service redesign and technology decisions within the States of Jersey. This will enable a common approach in a number of different aspects and improve strategic decision-making both with the business and with the Information Services function. It is intended that, over time, the Design Authority has oversight and influence over all of the major States of Jersey service and technical change, not limited to those activities within the eGov programme. 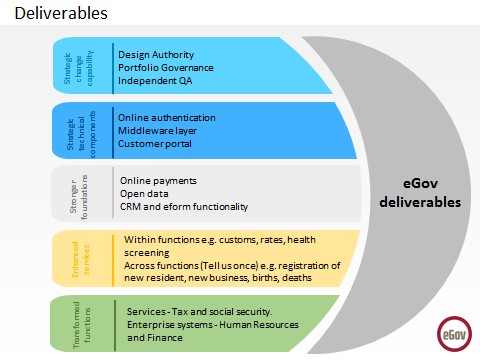 So whilst initiation of a Design Authority will come from eGov this capability should be established within the States of Jersey as a core function. In quarter three 2015 we will start the procurement process to seek support in building and running a Design Authority.